This recipe is a version of laing that you wrap a shrimp mixture made from shrimps, grated young coconut and salt then wrapped in taro root leaves then cooked in coconut milk with chili peppers and onions. This is also called pinangat in Bicol region but this is only a variation of the dish because meat is the usual filling used in pinangat. 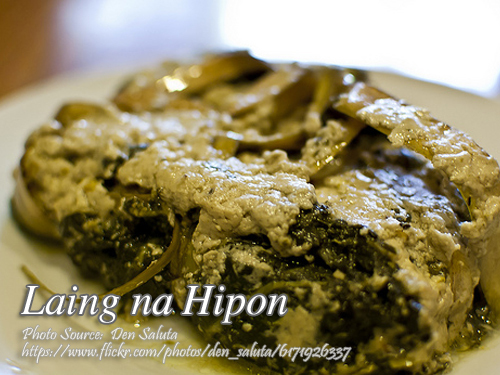 To cook laing na hipon; Mix hipon with onion, grated coconuts and salt. Wrap about 1 tablespoon of shrimp mixture in gabi leaves. Arrange in a pot. Pour thin coconut milk overwrapped mixture. Cover. Simmer over low fire. Shake pot to avoid burning of wrapped mixture. Add thick coconut milk and siling labuyo when slightly cooked. Continue cooking until sauce thickens. Mix hipon with onion, grated coconuts and salt. Wrap about 1 tablespoon of shrimp mixture in gabi leaves. Arrange in a pot. Pour thin coconut milk overwrapped mixture. Cover. Simmer over low fire. Shake pot to avoid burning of wrapped mixture. Add thick coconut milk and siling labuyo when slightly cooked. Continue cooking until sauce thickens. Serve while hot. what is thin and thick coconut milk we only have a can milk? Thick coconut milk is the first coconut milk extracted from fresh shredded mature coconut meat by squeezing. Then to get the thin coconut milk, dilute 2 cups on the shredded coconut and squeeze again and strain to separate the shredded coconut from the milk. In the canned version, the thick coconut milk is labeled as “coconut cream” and the thin coconut milk is just the ordinary canned coconut milk.